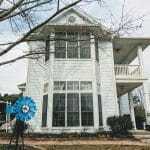 Please note that some of the links in this post are affiliate links and I will earn a commission if you purchase through those links. 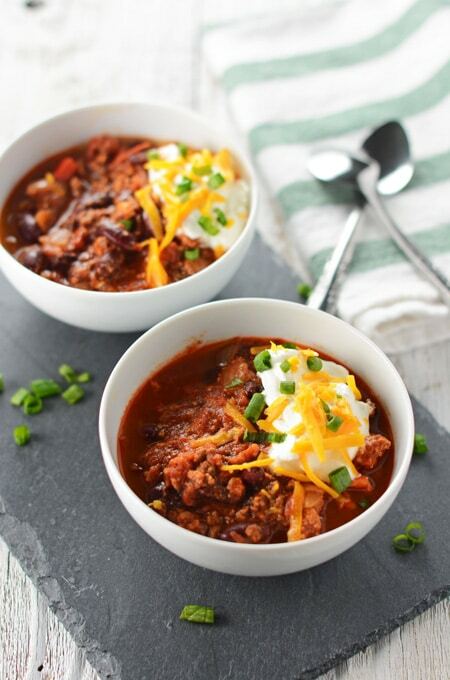 When some people hear “turkey chili” they might roll their eyes a little, similar to what my husband does. I get it. 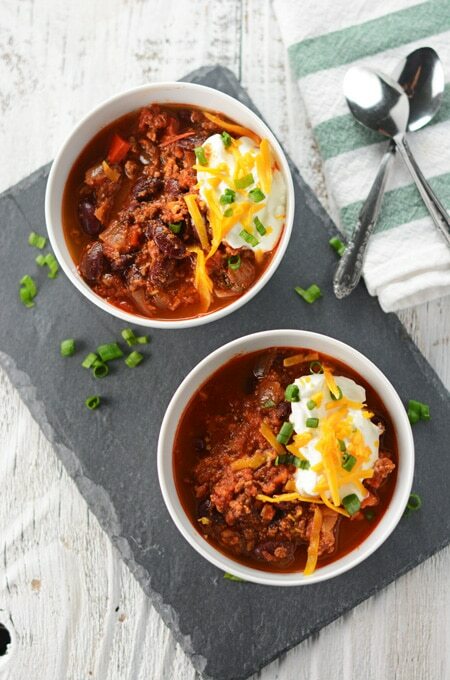 You might miss the flavor and heartiness of beef in a traditional chili, but this Simple Turkey Chili with Kidney Beans is anything but typical. 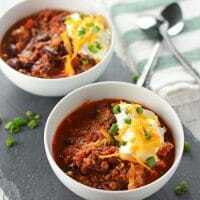 This is an easy recipe but does take some time, but most of it is just simmering time. 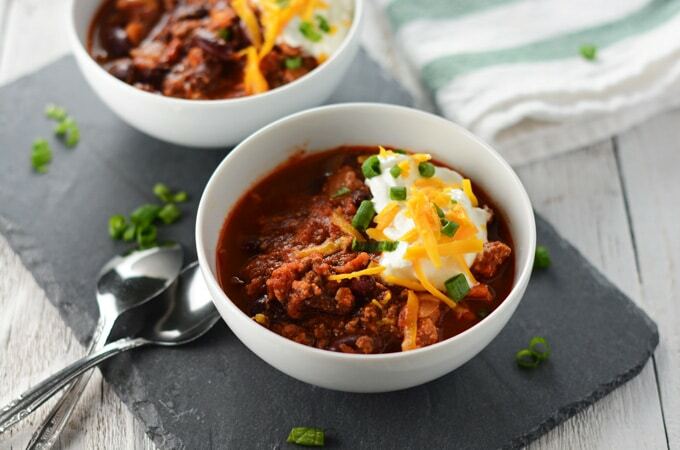 Keep reading to find out what makes this turkey chili different from some of the others you may have had. Because adding the turkey in the beginning of the cooking process breaks down into tiny pieces, it is best to reserve some of the meat and add it to the chili later. 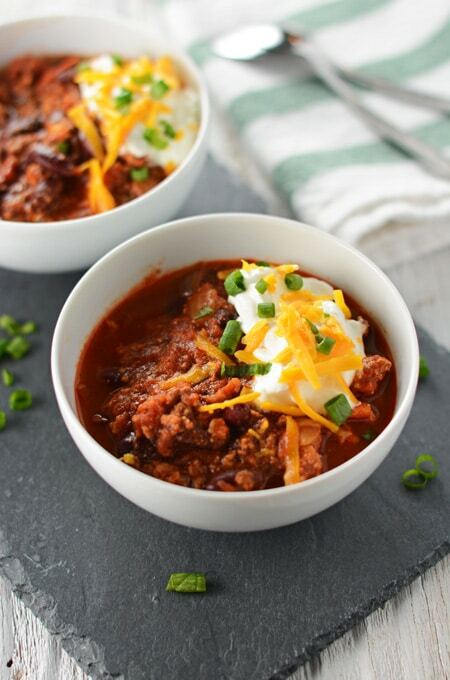 This will also give the chili an appealing chunky, crumbled texture, similar to ground beef. 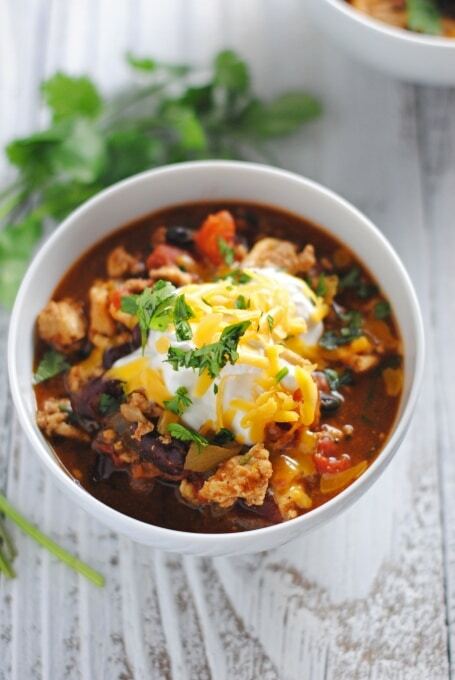 Here are some of the tweaks Americas Test Kitchen did to create this amazing Simple Turkey Chili with Kidney Beans. Adding the spices with the veggies boosted the potency of the aromatics. Then, the beans were added with the tomatoes so that they cooked enough to absorb the flavor, but not so much that they fell apart. 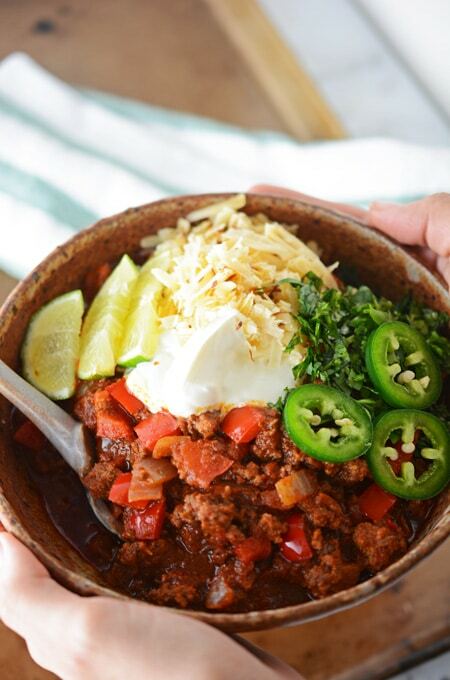 Top it all off with some of your favorite chili toppings such as, diced tomatoes, diced avocado, sliced scallions, chopped red onion, cilantro leaves, sour cream and shredded cheese. 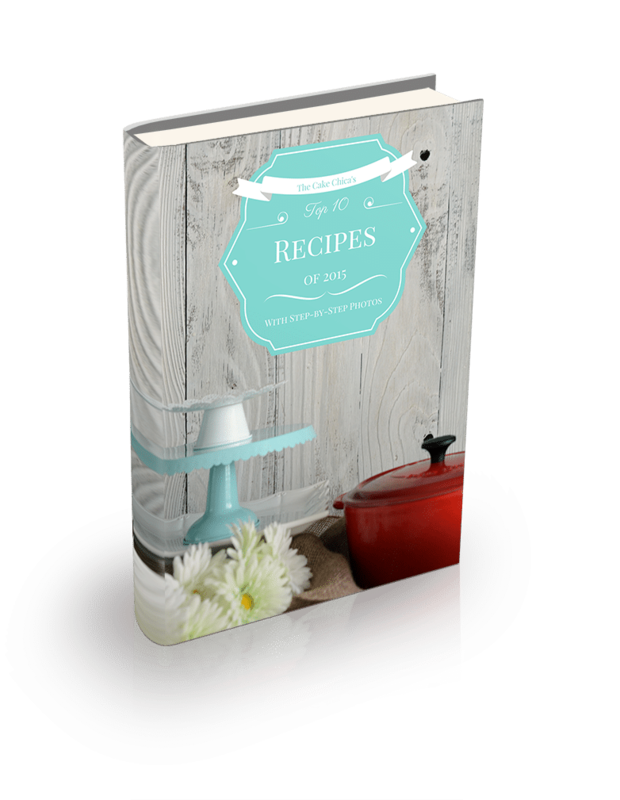 Don’t miss a recipe. 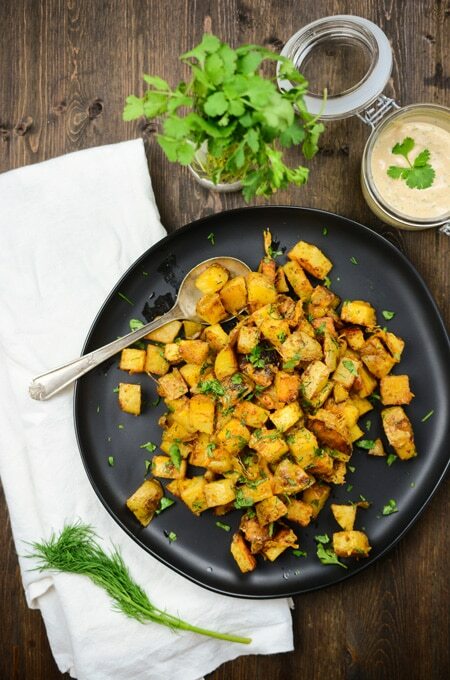 Subscribe to today and receive recipes straight to your inbox. Also follow me on social media Facebook, Instagram, Twitter, Pinterest and don’t forget to Yum some recipes! 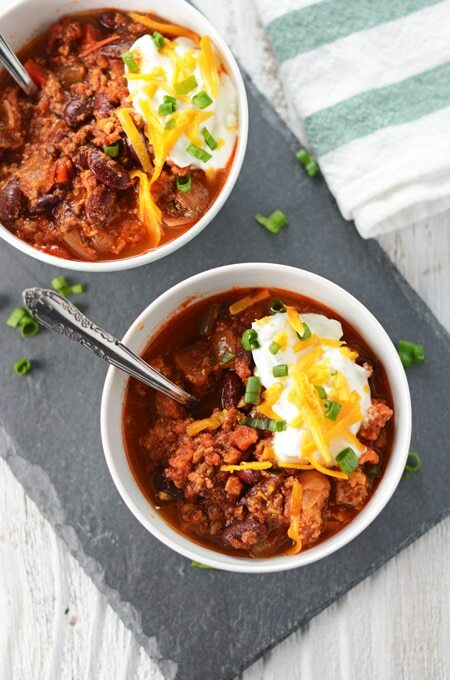 This may be the best turkey chili you'll ever have! Made with ground turkey, turkey meatballs, bell pepper, onion and a chili spice blend. Heat oil in large heavy-bottomed nonreactive Dutch oven over medium heat until shimmering but not smoking, 3 to 4 minutes. Add onions, bell pepper, garlic, chili powder, cumin, coriander, pepper flakes, oregano, and cayenne; cook, stirring occasionally, until vegetables are softened and beginning to brown, about 10 minutes. Increase heat to medium-high and add half the turkey; cook, breaking up pieces with wooden spoon, until no longer pink and just beginning to brown, 3 to 4 minutes. Add beans, diced tomatoes, crushed tomatoes, chicken broth, and 1 teaspoon salt; bring to boil, then reduce heat to low and simmer, uncovered, stirring occasionally, for 1 hour. Pat remaining 1 pound turkey together into ball, then pinch off teaspoon-sized pieces of meat and stir into chili. Continue to simmer about 40 minutes longer, stirring occasionally (if chili begins to stick to bottom of pot, stir in 1/2 cup water and continue to simmer), until turkey is tender and chili is dark and slightly thickened. Adjust seasoning with additional salt. Serve with lime wedges and condiments if desired.